Corrine Jackson's Touched has hit shelves this week, and I am super excited to be bringing you guys a little extra about this book, as well as a giveaway! Remy’s relationship with her mother is troubled. Her mother is married to a man who abuses Remy and her mother, and Remy often heals the injuries he inflicts on them. Desperate for her mother’s love, Remy suffers every time she heals her mother, even while her mother refuses to acknowledge Remy’s powers. At a pivotal point in the book, Remy discovers recordings that her mother has made. These recordings reveal a lot about their relationship and secrets that her mother has been keeping. And now you get a sneak peek at one of the recordings. Beware, though! The recordings have some spoilers for the novel. Yeah, there is so much awesome in this. As I said, Touched hit shelves Tuesday, from Kensington/Teen. Make sure you pick this one up (And Corrine's other 2012 release, If I Lie!). Book Summary: Remy O’Malley heals people with touch—but every injury she cures becomes her own. Living in a household with an abusive stepfather, she has healed untold numbers of broken bones, burns,and bruises. And then one night her stepfather goes too far. Being sent to live with her estranged father offers a clean start and she is eager to take it. Enter Asher Blackwell. Once a Protector of Healers, Asher sacrificed his senses to become immortal. Only by killing a Healer can a Protector recover their human senses. Falling in love is against the rules between these two enemies. Because Remy has the power to make Protectors human again, and when they find out, they’ll becoming for her—if Asher doesn’t kill her first. Want a chance to win this one? Just enter the Rafflecopter giveaway below, for this and the other prize packs up for grabs on this tour! Ooh interesting! I got the chills listening to that. 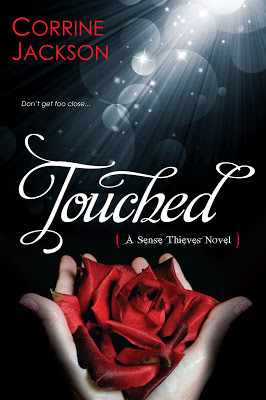 Can't wait to read Touched! The book sounds so good, I can't wait to read it!! I so bad want to listen to the recording but don't want any spoilers yet! I am excited for this one and I don't wait to be spoiled, so I'm going to skip on the recording. Been following the rest of the tour and getting hyped though. Thank you -- would love to win!! Love the trailer. Thanks for the chance to win!